Who's going to pay $50,000 for a new Dell computer? Who do those people think they are, Apple? $50,000 with 192 GB of RAM! There is no way that Dell can charge that much for a new PC. Doesn't Dell understand that this is a down economy and people would rather buy a netbooks that cost less than $300? The whole idea is crazy. When did Dell start selling $50,000 computers? ZDNet has an article, Dell Offers PC that Packs 192 GB of DDR3 RAM [Not a Typo], about a new Dell workstation that can hold 12 sticks of 16 GB DDR3 RAM. When they did the math to fully load up on memory, they came up with the $50,000 price. * Of course, it's not likely that many people will buy it fully loaded, but the possibility exits. My question: For $50,000, would it make a good gaming platform, or would a $999 PC beat it (see The $999 PC That Out-gunned the Mac Pro)? Then again, if you can afford $50,000 for a PC, why not spend a little extra to get a good video card? Sometimes people like to make crazy comparisons. It should be easy to see that comparing the price of a high-end workstation to a netbook or gaming PC is ridiculous, but that hasn't stopped anyone from making other equally silly comparisons. Always take off-kilter comparisons with at least a grain of salt. It is likely that hidden in there are a few details that can help explain the difference. * Dell doesn't actually sell such high capacity RAM. While the Dell Precision T7500 supports up to 192 GB of RAM, the most Dell will sell you is 4 GB. 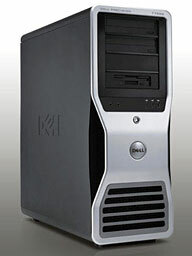 The computer starts at $1,800 with a 1.86 GHz dual-core Xeon E5502 CPU, 2 GB of RAM, 80 GB SATA hard drive (the $599 Mac mini has 120 GB), Nvidia Quadro NVS 295 graphics, DVD-ROM, Windows Vista Business, and no monitor. Based on 192 GB of RAM selling for $40,000 plus Dell's typical markup, they came up with the $50,000 figure.